After years of students struggling through cardio training in harsh Colorado conditions, students who sprint from University Hall to Main Campus in order to get to class will now be recognized as top-tier athletes. 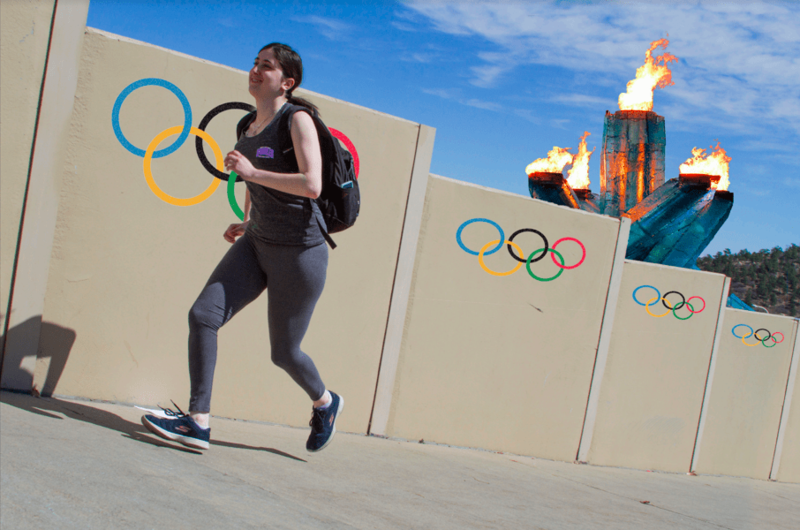 On April 1, the International Olympic Committee recognized running from UHall to main campus as an Olympic sport. The announcement comes just weeks after the 2018 Winter Olympics conclusion. Other sports recognized, only at UCCS, include e-gaming, debating and walking from University Center to Dwire Hall. “It’s garnered more attention to the campus outside of NCAA regulated sports and academics. It’s amazing that we could contribute to adding a new Olympic sport while being in Olympic City USA,” said Chancellor Rencat Teddy. Student athletes will train at the U.S. Olympic Training Center and this hill during all seasons to ensure they can sprint te 15-minute climb in any condition. Sophomore clown major Harry Buts is one such athlete training to compete in this sport during the next Olympic Games. “It’s nice to know that all of my hard work going to and from my classes is paying off. I’ve been training daily on that hill and at the Olympic Training Center. I want to be in the best shape of my life before the trials in spring 2024,” said Buts. Senior Twitter analytics major Derry Ayr has sprinted the hill since his freshman year. Ayr has built an impressive running time of 4:07, which has allowed him to get to main campus 20 minutes before his class starts. The hill will be replicated for use in the 2024 Paris Olympic games. The feat will be complicated due to the altitude difference, according to engineering professor Lesley Nope. “That hill is tricky to replicate. The committee in charge will have to find a way to add altitude to the Olympic space and recreate all the noises that annoy people like angry drivers on Austin Bluffs. Man, I wish they would let us engineering majors help with the construction,” said Nope. However, students are still up for the challenge. “No noises from angry drivers when I’m actually competing? Sign me up,” said Ayr. Since this is now an area for training, it has been closed off to students so if they miss the shuttle, they’ll have to scale the Bluffs.